I always get a ton of questions in regards to my hair. Whether it may be about how I style it, my color (it's natural by the way), or what kind of products I use. 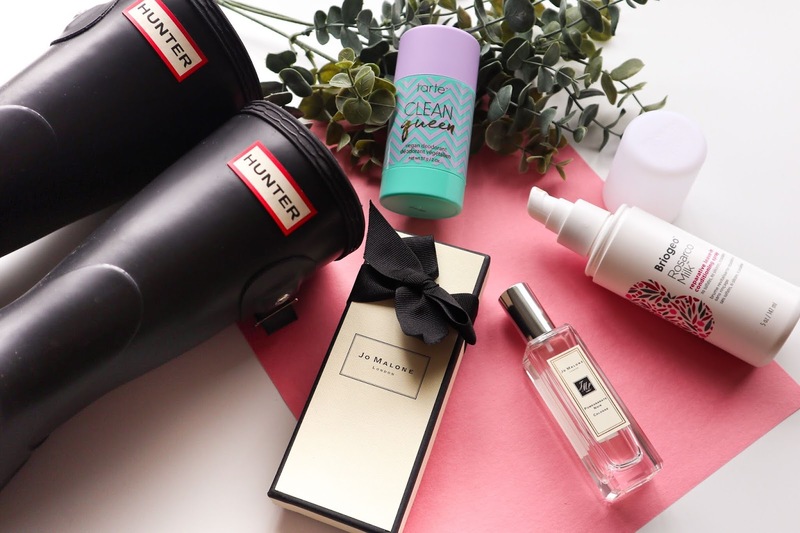 As time goes by, the products I use tend to change for one reason or another so because of that today I'm going to share yet another updated hair care routine with you guys. 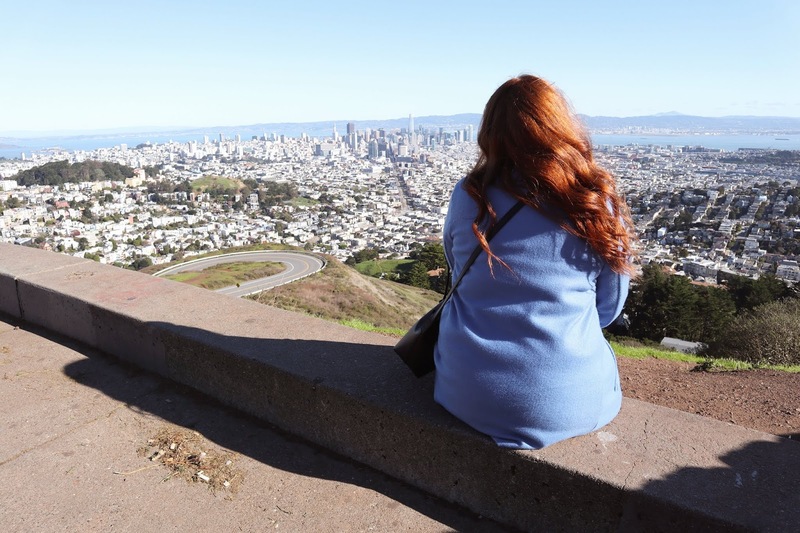 In my past hair care posts, I've gone a lot more in-depth with the back story of my hair journey and how I brought it back to its healthy stage, how many times per week I actually wash, and how often I heat style my hair. All of that still remains the same so if you haven't read any of those previous posts I'll just leave the link right here for you to check it out. 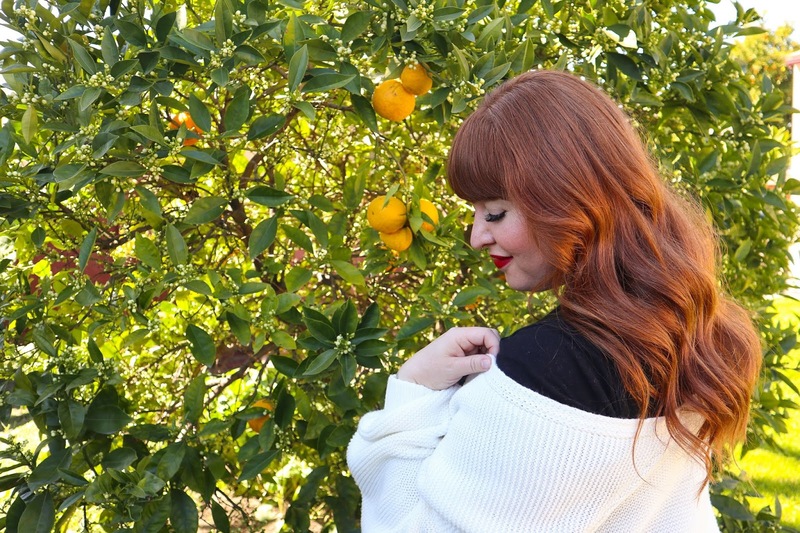 In this post, I'm going to dive straight into the products I've been using on my hair for the last six months or more. Now there's only one thing left to do and that's to begin this post! Beginning with what I use to wash my hair. 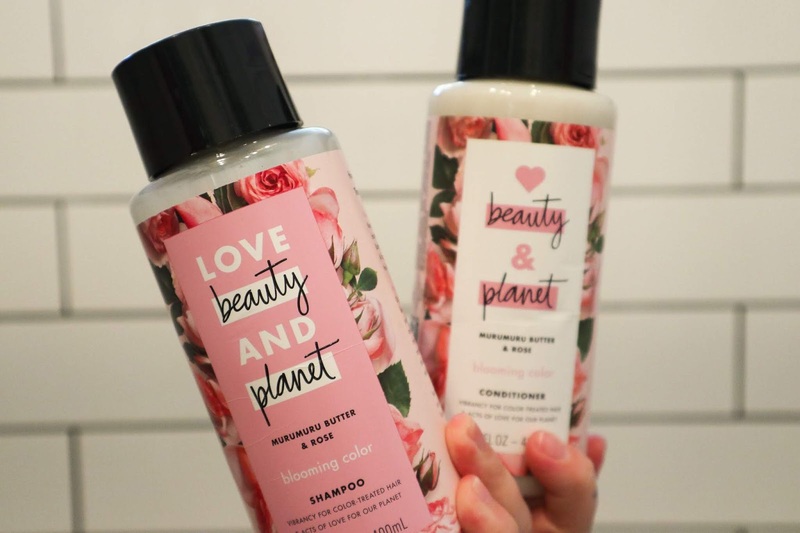 I am currently using the Love Beauty & Planet murumuru butter and rose blooming shampoo and conditioner. This is a cruelty-free, paraben free, silicone free shampoo and conditioner. They're both vegan and safe for color treated hair. The conditioner is also phthalate free. Both shampoo and conditioner are infused with organic coconut oil. The shampoo gently cleanses your hair and moisturizes for healthy glossy hair. While the conditioner works similar in moisturizing your hair, it also corrects detangling. These two really helps with leaving my hair feeling super soft and healthy, but one of my favorite things about it is the rose scent. I'm a huge fan of anything rose scented and these two smell amazing. I even use their deodorant in this same scent! Once a week I like to do a deep cleanse to my hair and for over a month now I have been using the Maple Holistics Silk18 shampoo. I spoke about Maple Holistics in a past currently post and on my last updated hair care routine post. At that time I was really enjoying their Tea Tree shampoo they sent me. Recently, the company reached out to me once again asking if I'd be interested in giving their new shampoo a try. Of course, I said yes since the Tea Tree shampoo did wonders to my hair. I have really been enjoying this new shampoo, I just love how clean their shampoos make my hair and scalp feel. 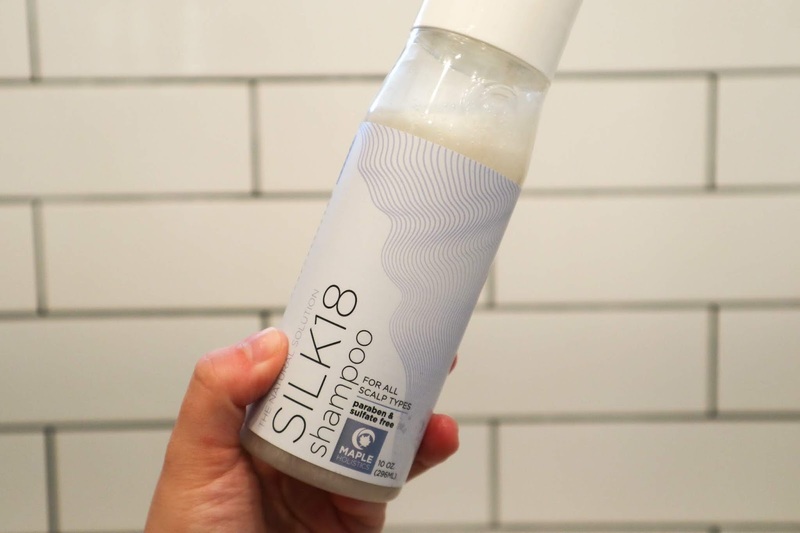 Silk18 contains a blend of eighteen silk amino acids that help support hair follicles and strengthen and protect hair from split ends, dryness, breakage, and damage. The gentle formula cleanses dandruff and it even protects against fallouts. My hair is left feeling fresh but never stripped. Argan and jojoba oils are infused into this formula which leaves your hair soft and shiny. Lastly, Silk18 is a sulfate and paraben-free shampoo. As soon as I am done washing my hair, I like to lightly towel dry it then I'll leave it wrapped in the towel for about ten minutes or so. That way I can give it time to dry on its own before going in with a blow dryer. 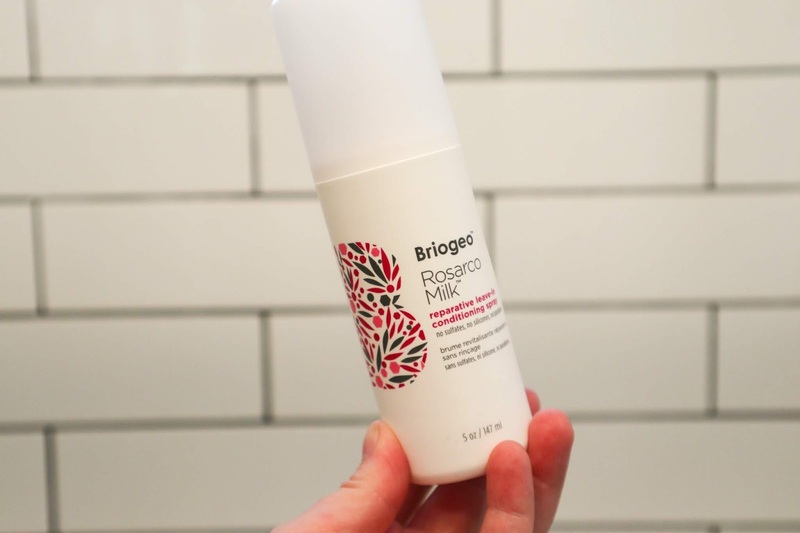 After I remove my towel from my hair and before going in with any heat styling products I spray the Briogeo Rosarco Milk reparative leave-in conditioning spray throughout my hair, avoiding my bangs. I have been using this product for two years now and I just love it. It doubles up as a heat protectant and a leave-in conditioner. It strengthens your hair and helps restore its shine. I've raved so much about this spray in the past you guys just have to take my word for how great it is. 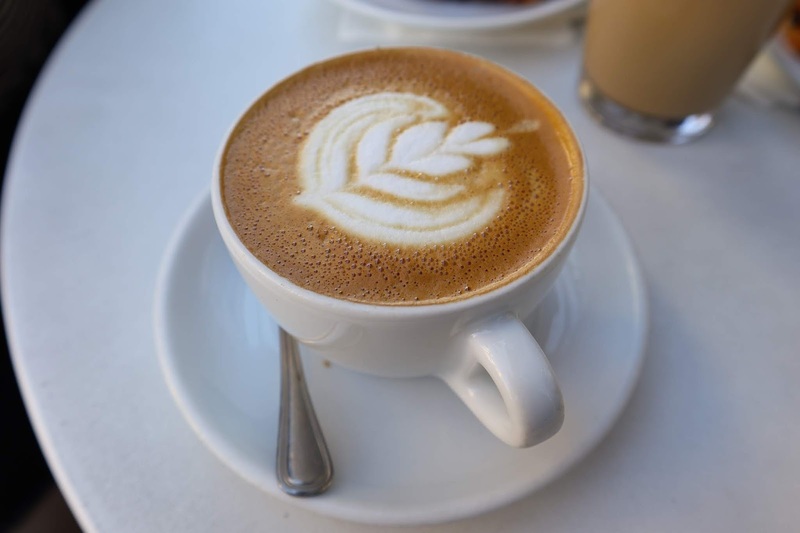 Give it a try, you won't be disappointed! Immediately after I use a quarter size amount of the Briogeo Rosarco blow dry perfection & heat protectant créme mainly from the middle half of my hair until the ends. This may be a product I can totally skip, but I enjoy including it in my routine. It has some slightly different benefits to it compared to the leave-in conditioning spray. This créme tames frizz, smooths the hair and helps with preventing split-ends. I really try to nourish and protect my hair as much as I possibly can, if you didn't already know that by now. Once I'm done blow drying my hair followed by styling it with either a straightener or curler I use one pump of the Bumble And Bumble Bb. 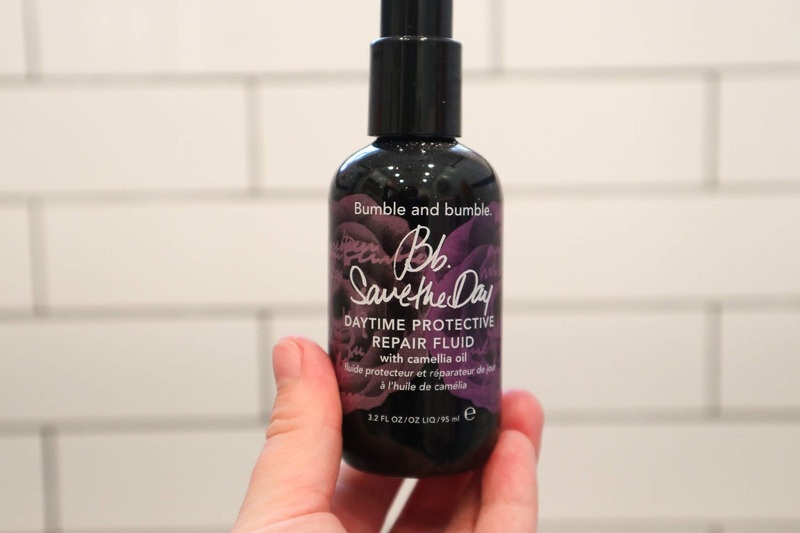 save the day daytime protective repair fluid mainly from the middle of my hair to the ends. I have been using this product now for over a year and a half, to be honest, I'm surprised I didn't include it in my last hair care post. Bb will smooth, soften and hydrate your hair. It will repair split ends and protect hair from heat and UV damage. Another product I absolutely love! This guy leaves my hair so soft and it smells so good. I really do feel an immediate difference in my hair once I put it on. It gives my hair a healthy soft look and its formula is lightweight and will never weigh down my hair. 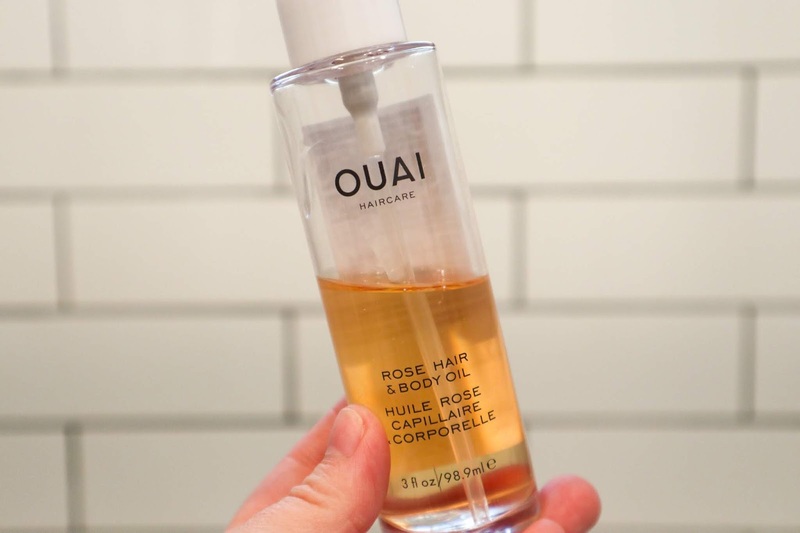 If my hair is looking or feels a little dry after I'm all done styling it, I'll use half a pump of the OUAI rose hair + body oil. Occasionally I do like to apply a little bit of oil to my hair but only on the ends! This oil is wonderful since it can be used for hair and body. I enjoy how it feels on my hair, it definitely enhances the shine my hair might be lacking on certain days and I actually do use it pretty often on my body which I absolutely love. I only use a very tiny bit of this oil because a little goes a very long way. When I first started using this I didn't realize how much hydration it gives and my hair would even end up looking a little too greasy. Half a pump or a few drops works wonders. I even mix it with the Bumble And Bumble repair fluid sometimes. For dry shampoo, this may come as no surprise to some of you. 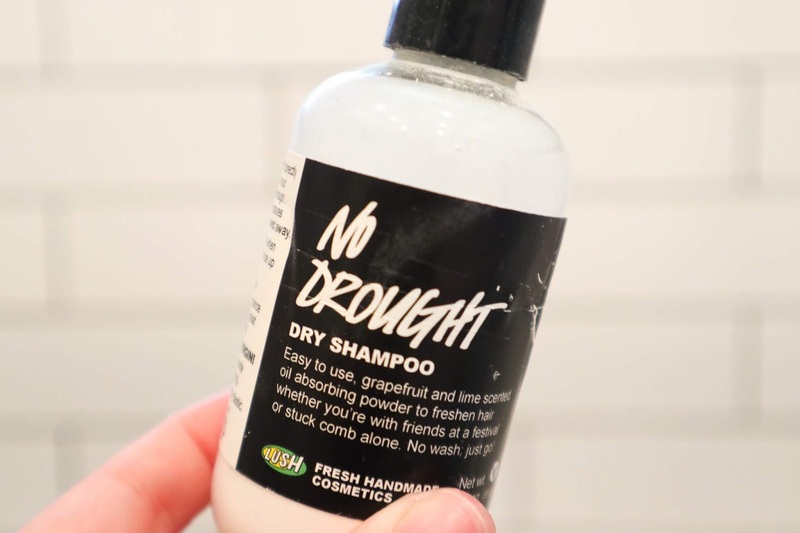 I still use the Lush Cosmetics no drought dry shampoo. Through the year I have gone through a couple other dry shampoos but this is still the one I always reach for the most and end up going back to. It does such a fantastic job at absorbing all of the oils on my hair. It leaves it looking fresh and clean, that's one thing I demand in a dry shampoo is that it leaves my hair looking clean. No Drought smells great just like fresh clean lemons and won't weigh my hair down. It actually gives me some volume after I work it into my hair. Past dry shampoos even left my hair feeling more dirtier and with some build up on the roots. No drought checks off everything I'm looking for in a dry shampoo. My only complaint, which remains the same is the packaging. Lastly, once a week I really like to nourish and treat my hair to a hair mask. 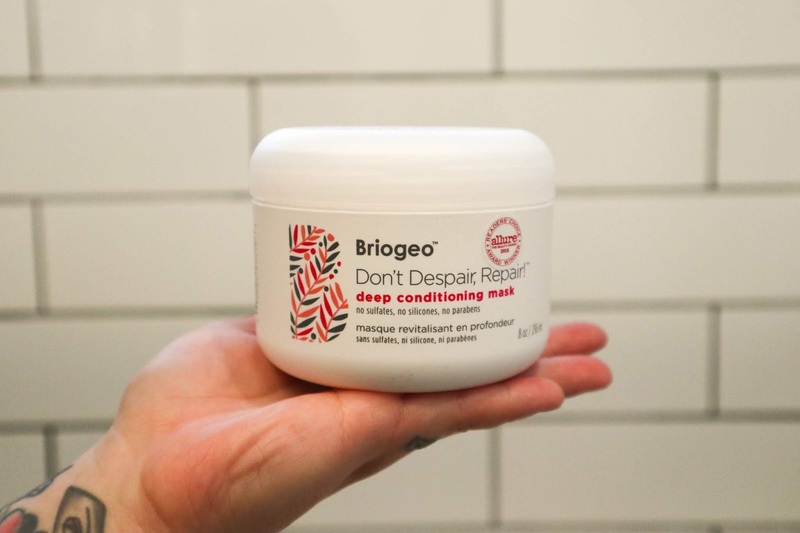 For the last two months, I have been using the Briogeo don't despair, repair! deep conditioning hair mask. Prior to this hair mask, I was using Roots from Lush and I loved it! I had been wanting to pick up this mask for so long and I've really been enjoying it. Compared to Roots, it is a lot thinner in consistency but still works great at conditioning my hair. This mask will improve hydration and give you more vibrant hair. It also helps to prevent future damage. I apply this to dry hair, then comb out my hair and leave it in a braid overnight or even a few days until the next time I wash my hair. I haven't had any problems with conditioner weighing my hair down or leaving it oily or anything. I wash my hair normally with my shampoo and conditioner afterward and my hair looks fresh and bouncy with each use! I would love to know what are some hair products you guys swear by. I absolutely love Lush and Briogeo hair products, if you couldn't already tell. At the end of the day if you end up using anything from either brand I can ensure you, you will see nothing but great results with your hair. I have to try that Lush Dry Shampoo, I've been using the Hask Dry Shampoo and I like it but the Lush one sounds really good. 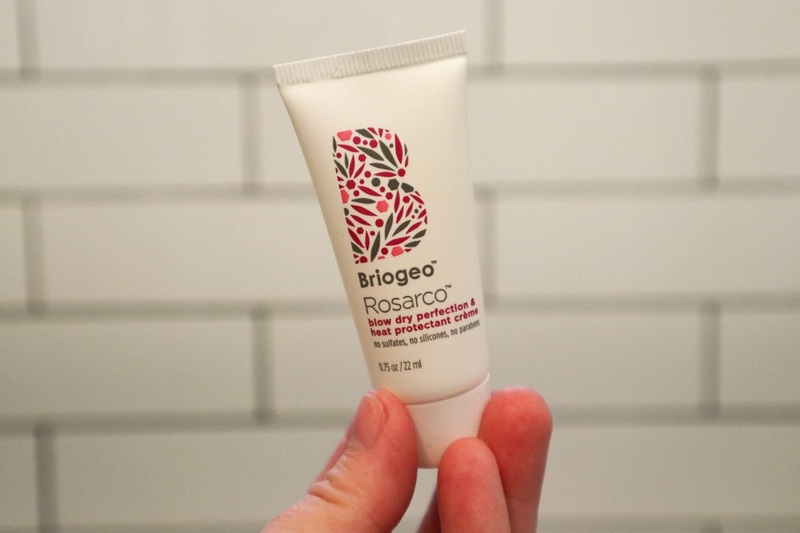 Girl the Briogeo Rosarco creme is everything, I love it too! You should try the OUAI Scalp & Body Scrub, I mainly use it for my hair since I use the Lush Magic Crystal for my body but my hair always feels extra clean when I use the OUAI Scrub. 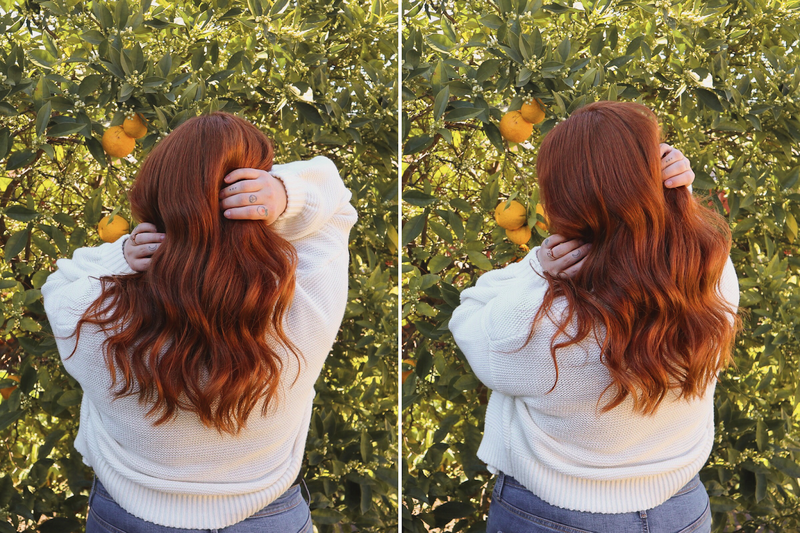 BTW, your hair looks stunning in these pictures! The Lush dry shampoo is amazing and I'm still using the first bottle I ever purchased lol. It definitely lasts a long time. I've never used a scalp scrub but I have a small travel sized of the one Briogeo carries and have yet to use it lol. And thank you so much, I love how my hair looks in these photos. Thank you so much Madison! Briogeo's products are amazing! Your hair looks so wonderful and shiny! Thank you Danielle, I take such pride in taking care of my hair. Thank you! I really enjoy the Love Beauty and Planet shampoo, even though it says for color treated hair, I still use it. It also smells so amazing, but if you're not into rose they have a large variety of scents to choose from. Oh your hair looks so healthy and full.. LOVE! Thank you Lisa. I love how my hair currently is, it's come a long way. I'll have to check Briogeo out! I've been looking for a good hair mask product and your hair looks so good, I'm convinced!! Thank you! You wont regret it. Briogeo has such good hair products. You might even want to look into Roots by Lush! I think I like that one a tiny bit more than the Briogeo one.